It’s in the ordinary everyday things with which the Berlin artist Roland Stramann deals with in his work. 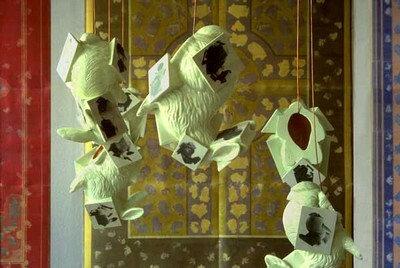 In his installations, there are newspapers, porcelain plates, vases and knick-knacks or simply cardboard boxes from the supermarket. Defamiliarized and transferred into a new context, Stratmann presents these objects to the viewer from an unusual perspective. 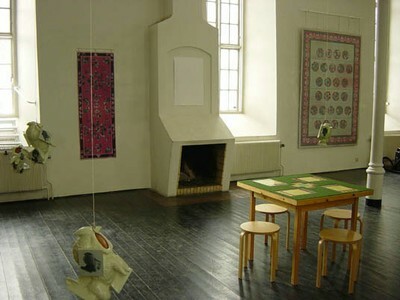 In the Ålgarden Gallery, Borås, the artist is showing his body of work “Mobil Trädgård” created between 1995 and 2000. 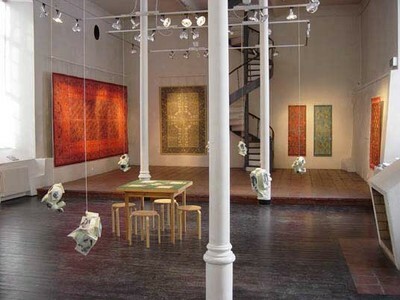 This period of work is an homage to the culturally-historical development of the carpet, originally meant to reproduce paradise and a depiction of the Persian Gardens, creating what was supposed to be then a mobile garden. At the same time Stratmann brings out as his central theme the loss of information, through derivation and overlapping, which came about with the transmission of handed down symbols into a pictorial language. 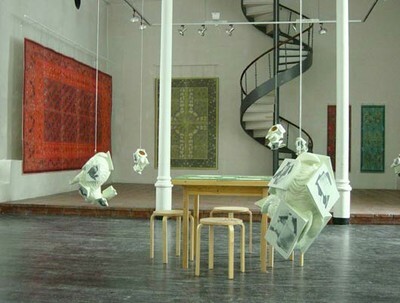 On the walls are largely formatted paperwork looking like carpets, and hanging upside down from the ceiling are ceramic hares leading you throughout the exhibition. Tracks and traces are cut into the double layered paper work bringing a narrative level to the game. The carpets on the walls are produced with a photo rubber printing process, a procedure stemming from 19th century photo technology. Because of the varnished and multiple paint layers made out of water colors, rubber arabic and a light sensitive emulsion, a pictorial and material impression is achieved. 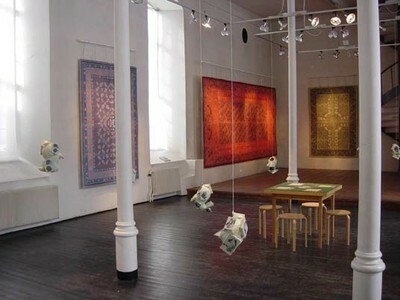 It is in any case necessary to have a closer look to realize that it is all photography and not real carpets.